These days heroes are few and far between. I have since 2011 been writing about the two French aviators, Nungesser and Coli, who should be in the history books as heroes, but are practically unknown outside of aviation circles. Charles Eugène Jules Marie Nungesser (35) and François Coli (46) left Paris’s Le Bourget Airport on May 8, 1927, to fly non-stop across the Atlantic in a Levasseur PL.8 biplane. 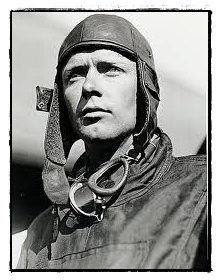 Never before had someone flown the Atlantic without a halt: Charles Lindbergh had not on that day yet done so. Nungesser and Coli’s plane – l’Oiseau Blanc (White Bird) – was seen flying off the French coast at the town of Etretat in Upper Normandy, and then not again. I am not going to say ‘never again’ because sightings of a plane which could have been the l’Oiseau Blanc had been reported off the Newfoundland coast. The two aviators’ plan was to fly across southern England, then across Ireland to the Canadian coast and then down to New York, some 5,800 kms (3,600 miles). The question is did the two aviators make it across the Atlantic which would make them the first to have done so non-stop? Charles Lindbergh did. Having set off from New York in his ‘Spirit of Saint Louis’ on May 20, 1927, knowing that the l’Oiseau Blanc and its two aviators, Nungessor and Coli, were missing, he landed at Paris’s Le Bourget Airport on May 21. 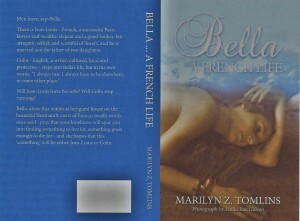 His first words on stepping onto French soil was to ask if there were any news of Nungessor and Coli. 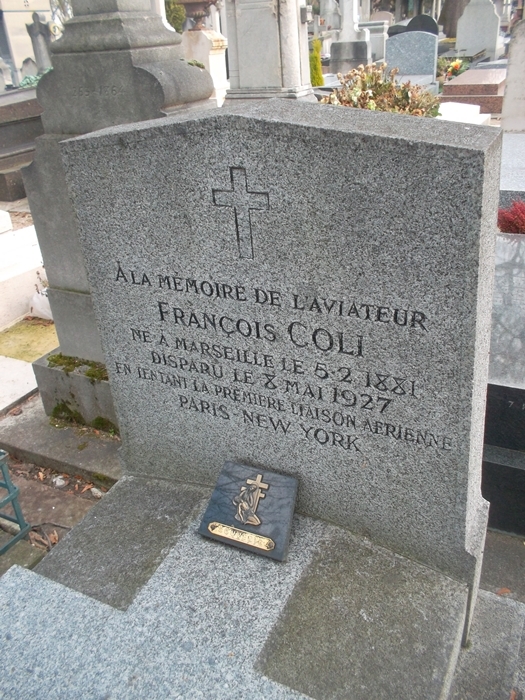 On February 13, 2015 I visited Coli’s tomb in Paris’s Montparnasse Cemetery. His wife’s body lies in the tomb, but not that of Coli: his body and that of Nungesser were never found, and also not the wreckage of their plane. 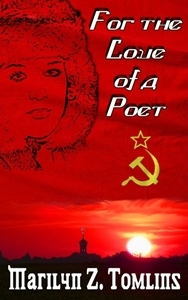 I wrote about the two aviators here on Feb 12 2011, and here on July 19 2012, and here on Oct 27 2012. If you could read those three pieces before you continue to read this because I won’t be repeating all of it here. The two had set off at 5.17 am from Paris’s Le Bourget Airpport. Their plane which weighed 5,000 kg (11,000 lb) carried 4000 litres (1056.7 gal) of fuel. Heavy for an aircraft of a length of 9.75 m (31 ft 11 in) and a height of 3.89 m (12 ft 9in) and with a wingspan of 15 m (49 ft). Escorted on take-off by four French fighter aircraft, the l’Oiseau Blanc, barely cleared trees at the end of the airfield. As planned they then hooped back to the airfield and dropped the plane’s main undercarriage. The next day, May 9, in the afternoon, a welcoming committee and a crowd of aviation enthusiasts awaited the plane’s arrival in New York’s Battery Park. The plane did not arrive and its fuel load having allowed it 42 hours of flight time, the terrible realisation hit that the plane had crashed either into the Atlantic or on land in Newfoundland. There was certainty of only one thing which was that the plane had not crashed in France because the four fighter aircraft had escorted it to the Etretat coast and 20 nautical miles southwest at the Isle of Wight the crew of a British submarine had spotted it. It had also made it to Ireland too as a resident of the southern Irish coastal town of Dungarvan had spotted it and that man could be believed: he was a Catholic priest. For nine days the French, United States and Canadian navies and air forces searched for the plane at sea and in the New York and Newfoundland land areas and not finding any trace of it, the search was called off. 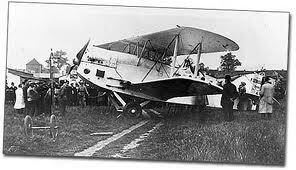 Twelve days later Lindberg (25) landed in Paris. The French gave him a hero’s welcome and who today have not heard of Charles Lindberg? In 1980 Nungesser’s nephew, the politician Roland Nungesser (1925-2011) encouraged the French government to renew their efforts to find out what had happened to the two aviators and three years later after having studied every report of a sighting of a small aircraft or of aircraft debris along the l’Oiseau Blanc’s intended flight path from Paris to New York, France’s Ministry of Transport indicated that the l’Oiseau Blanc could have made it across the Atlantic. Proof that l’Oiseau Blanc did was however needed, which there was not, so interest yet again began to fade. 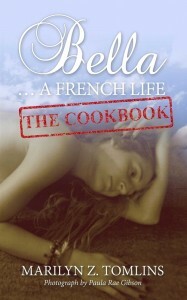 In 2008 Frenchman Bernard Decré, creator of the ‘Tour de France à la voile’ yachting race around the coast of France, and an aviator himself, revived the interest in creating an organisation – La Recherche de l’Oiseau Blanc (The Search for the White Bird) – to search for the plane’s wreckage. In February 2011 when I first wrote about Nungesser and Coli and their l’Oiseau Blanc, Monsieur Decré with the backing of SAFRAN, the French air defence and aerospace company, and the Hong Kong entrepreneur Sir Michael Kadoorie, was to set out on a third sea search for the l’Oiseau Blanc. The search which was undertaken in June 2012 at a cost of €220,000 ($297,000 / £189,000), just like the two searches before it, failed to find the plane’s wreckage and the remains of the two aviators. Monsieur Decré led a fourth and then a fifth and next a sixth search for the l’Oiseau Blanc in the years 2012, 2013, 2014 all, alas, without success. Also in 2012 he had spent three hours studying debris from a small white aircraft – of course as its name implied l’Oiseau Blanc was white – kept at the Musée de l’Air et de l’Espace au Bourget, the air museum at Paris’s Le Bourget Airport, but the debris were not those of Nungesser and Coli’s plane. If I am writing about Nungesser and Coli and their l’Oiseau Blanc again now, it is because Monsieur Decré will not only be making another search for the plane in July this year, but mid-March he will be in Washington D.C. for meetings with NARA (National Archives and Records Administration), the FBI, the American Senate, and the Smithsonian Air and Space Museum. 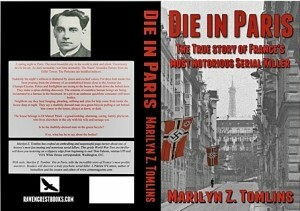 For some years one theory for the disappearance of l’Oiseau Blanc has been that the plane had been shot down. During America’s prohibition (1920-1933) rum-runners sailed the seas off Newfoundland and the upper east coast of America. They picked up their supplies on the French islands of St. Pierre and Miquelon (Saint-Pierre-et-Miquelon) 25 km (16 miles) off the southern coast of Newfoundland. St. Pierre and Miquelon was then a French colony and today it is still French – a French overseas territory. Of course there was no prohibition in France, so the rum trade in those two islands was booming. It is believed, and Monsieur Decré does so too, that American coast guards patrolling the coastline by cutter and plane had shot down the plane. On the plane’s fuselage was painted Nungesser’s personal World War 1 flying ace logo of a skull, two crossbones, two candles and a coffin within a heart. Also on the fuselage was painted the French Tricolor which clearly identified it as French. Therefore, seeing that the plane was French and there was a problem with rum-running from the islands of St. Pierre and Miquelon the coastguards had no doubt that the plane was rum-running. 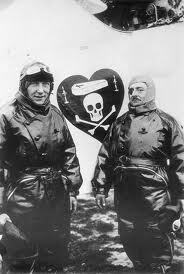 Nungesser and Coli with the death head logo on their plane. This is a theory as I point out. 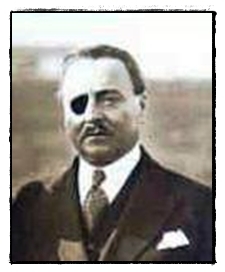 Monsieur Decré’s belief that the American coast guards had shot down the plane was strengthened at the end of last year when, going through documents in France’s ANON, Archives nationale d’outre mer (National Archives for Overseas Territories) in the town of Aix-en-Provence, he had found a letter which was written in July 1927 by a fisherman. The letter addressed to the island’s governor was to complain that the buoys the coast guards have placed in an area of 6 miles around the Lighthouse of Galantry were cutting their fishing nets. According to the logbook the Modoc was on that morning at Cape Race, Newfoundland. According to Monsieur Decré’s calculation the l’Oiseau Blanc would have been there at Cape Race on that morning of May 9, 1927. His mid-March visit to the States and the meetings he has planned with the FBI etc is to discuss with them the possibility that the American coast guards, having thought the l’Oiseau Blanc was rum-running, had shot it down. And for proof of course. 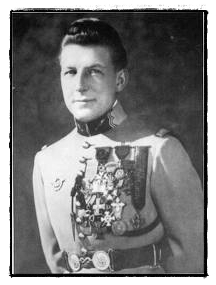 I will end by saying that if Rear Admiral Frederick C. Billard (1873-1932) had shot down the l’Oiseau Blanc then what a cover up this was. And what a story this is. 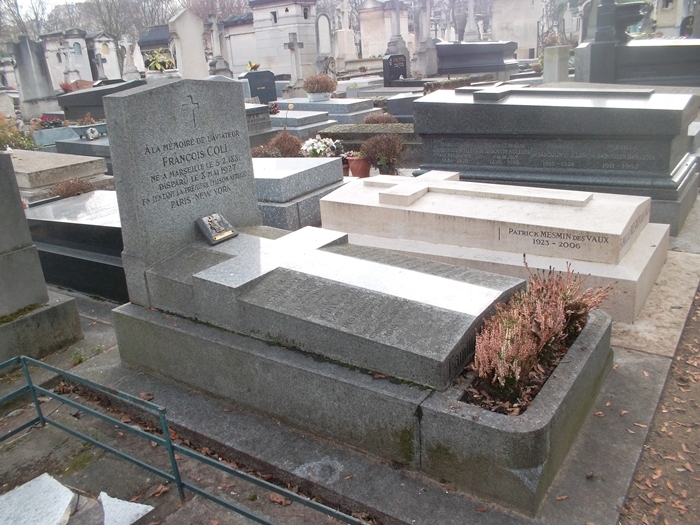 If you wish to pay homage to Coli you will find his cenotaph in Montparnasse Cemetery in 11th Division. His wife lies buried there. 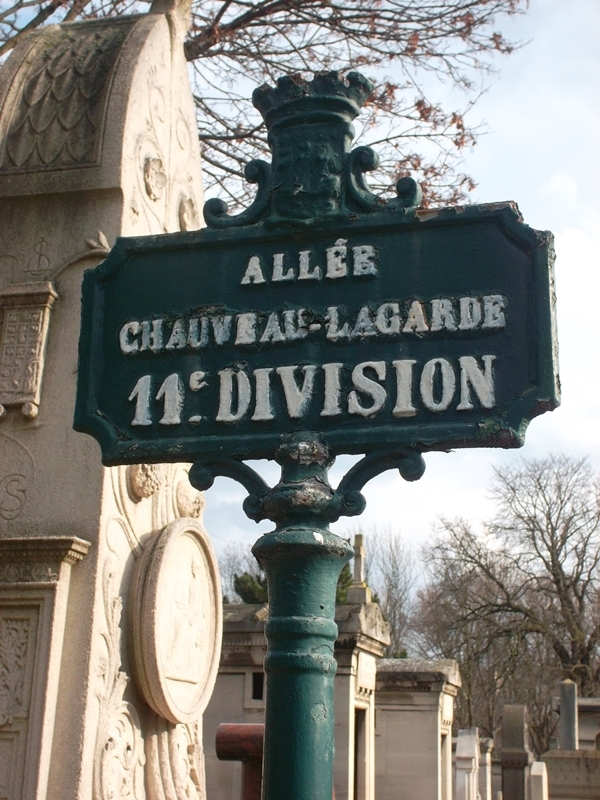 The cenotaph is just off Allée Chauveau-Lagarde. You will see it when walking along the lane. Monsieur Decre, Always good to get a comment from you. Thank you. During that special years 1919 to 1935 USA was under the control of “bad boys”, who make a lot of uncontrolled hudge money…France was not very clear with our french Islands: Saint Pierre and Miquelon, like the biggest Duty free shop in the world, we sold so much (good) Wines and alcools…Our position was not so clear. I know you are working hard for Nungessor and Coli to receive the honour due them. I like the idea of the barbecue of lobster and french fries! SInce 9 years I spend 50hours a week to understand the end of the White Bird. What Coli did not imagine was the very bad area for flaight around Saint Pierre and Miquelon Islands…during prohibition it was like a war area between US Coast Guards and Bootleggers. So when Nungesser arrive with his plane where the Black pirata ensign was so clear/ he looks like a pirata aircraft…so we can understand the fight against this aircraft…If the US Modoc fight him, and realize somme hours or days after he make a mistake…Our French government with US government arrange the reality and say: they fall on the Chanel…. Amelia Earhart’s story is not bad either. Thanks for the article. The Nungesser/Coli flight to me is more interesting than the Earhart story, because of the possibility that the White Bird (the engine, anyway) may be somewhere in North America. The probability of finding some clue, though remote, is higher than finding Amelia’s Electra. Very interesting indeed. Can’t wait for the outcome of this. Well done and well researched.